My interest in Miss Supertest III is quite an intriguing one. It all started in June 2011. As a member of the Norwich Municipal Heritage Committee, I attended the Ontario Heritage Conference in Cobourg, Ontario from June 3 to 5, 2011. I took Peter Lockyer's workshop Making History: The Economics of Heritage. With my love of writing and journalism, I was pleased to hear this former CBC Journalist speak. While watching one of his films, a snippet of his work and website History Lives Here Inc., I was puzzled but intrigued to see a picture of Miss Supertest III. I wondered "what is a boat in the Ingersoll Cheese & Agricultural Museum doing in a film by Peter Lockyer?" Peter then explained how the Miss Supertest was going to be on loan in Prince Edward County, where he lives, to attend a three-day celebration in August to launch a commemorative stamp honouring the boat. After his presentation, I introduced myself to Peter Lockyer and asked if he would consider coming to Oxford County to do a presentation. He would. Then I inquired more about Miss Supertest III. 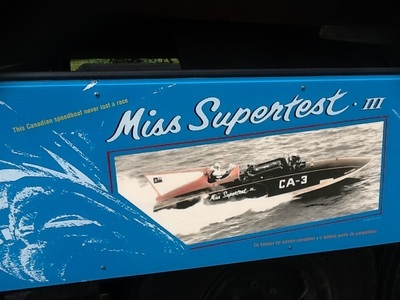 Peter informed me how Miss Supertest III would be returning to Picton, Ontario after fifty years and how he was launching his documentary on the both the boat and the Embro chicken farmer Bob Hayward who drove her. He invited me down to attend this historical event. An offer I could not refuse and one which would change my life for the love of hydroplanes. With my friend and follow historian Marie Avey, we drove the two hour trek to Picton, Ontario and stayed at Peter Lockyer’s cottage. On August 8, 2011 Marie and I attended the Loch Sloy Business Park, Hanger #4, in Picton, Ontario for the Miss Supertest III Stamp Unveiling Ceremony. While checking out the numerous displays, hydroplanes, vintage boats, memorabilia and vendor booths, I stopped to browse a book. I noticed the name Guy Lombardo and thought this odd. I did not know that this Canadian musician and famed bandleader from London, Ontario, who had a museum named after him, was a powerboat racer. Author of Roostertail: The Miss Supertest Story John Kelly explained that Guy Lombard was a great racer who won twenty of twenty-one hydroplane races with his boats Tempo VI and Tempo VII. He also is indicted into the Canadian Motorsport Hall of Fame. Who knew? I then stopped by Rick and Chris Fralick’s booth, Fralick Boats. (I blame Rick Fralick for becoming a groupie.) While speaking to Rick he mentioned that Woodstock held hydroplane races for years. As a historian I was embarrassed that I never knew this. Rick went on to explain that over 100 participants would attend the Woodstock International Regatta held at Pittock Dam. 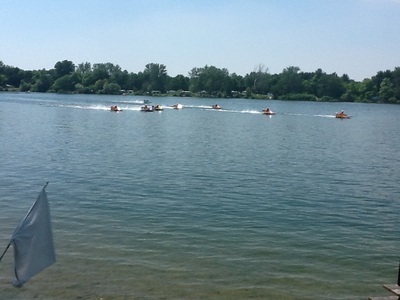 In 1982 the Canadian Boating Federation wanted to hold the National Powerboat Championships in Woodstock which would have attracted about 5,000 spectators and over 300 racers to the event. However, a petition against the race pressured Woodstock Council not to proceed.